The Night the Posse Chased Santa. December 23 will mark the 89th anniversary of the bloody melodrama which was about to take place in the town of Cisco in West Central Texas, on the day before Christmas Eve 1927. I know about it because of an article written at the time by the great Texas columnist, Boyce House. He should know. He was there. House wrote that this was "the most spectacular crime in the history of the Southwest ... surpassing any in which Billy the Kid or the James boys had ever figured." Here's the story told sometimes in my words, sometimes in House's. A smiling Santa Claus came along Main Street December 23, 1927 stopping to chat with eager children, answering their questions and patting them on the head. When Santa came up to the First National Bank, he looked all around, to his left and to his right, the way you would if you were about to sneak into the movies after your mother told you that you couldn't go. Some of the happy children who had followed Santa, continued on into the Bank after him. Once inside, Santa received a pleasant greeting of "Hello, Santa," from the cashier. Santa did not respond, but walked to a desk in the middle of the lobby, the one where bank customers wrote out their deposit slips. A few customers were already at the teller's window making their deposits. The cashier again called out, "Hello, Santa." Again, no response. Right about at this point, a young man entered the Bank, pointed a pistol at the cashier, and snarled, "Hands up!!" A second bandit entered. He was also brandishing a gun. A third armed man entered. Santa Claus pushed through the swinging door, past the cashier's desk, went into the cashier's cage, opened a drawer under the counter, and removed a pistol from that location, stuffing it under his red Santa suit. Now there were four armed men, including Santa Claus. Santa ordered the assistant cashier to open the safe, and began stuffing money and bonds into a sack he had hidden beneath his costume, a sack that should rightly have held Christmas toys for children. But not this Santa. Unseen by the four unsavory robbers, a woman bank patron made it through the bookkeeping department and out the side door of the bank, which opened onto an alley. She ran until she reached the police department and entered, shouting, "The First National is being held up!" Here I quote House's article: "Police Chief G.E. (Bit) Bedford, a giant of a man and a veteran peace officer, seized a riot gun and he and Policeman George Carmichael started for the scene. The chief posted himself at the mouth of the alley, which ran alongside the bank and opened on Main Street, while Officer Carmichael took a position near the mouth of another alley which ran behind the bank and intersected the first alley." Meanwhile, inside the bank, one of the men, with an automatic in each hand, growled at the bookkeeper, "Don't look at me!" By this time, Santa Claus had filled his sack with loot. He then fired, the bullet striking the bank's plate glass window. It was surmised at the time that this shot might have been a signal to unseen accomplices that the robbery had been accomplished. Immediately, Bedford and Carmichael directed cross fire at the side door and the two-gunned robber fired back, first at Carmichael and then at Bedford. The four robbers took as hostages two little girls who were in the bank and, using them as shields, made their way into the alley to a getaway car. A bullet struck the cashier in the jaw, another struck a bank customer in the leg, while yet another customer made a run for it and was able to tell Bedford and Carmichael about the hostages. More than a hundred shots had been fired, one hitting Policeman Carmichael and another, Chief Bedford, as the getaway car screamed out of the alley, turning south on Main. One of the shots from law enforcement had hit the tire of the getaway car, flattening it and stopping the car. The robbers, one of whom had been hit by a flying bullet, lurched out of the vehicle, brandishing their guns and commandeering a passing car. They transferred the loot, the little girls, and their injured comrade. They hadn't reckoned on one smart Texas kid, 14-year-old Woodrow Wilson Harris, who had been driving the commandeered car, and had removed his key from the ignition when he had been ordered to stop. The bandits could not start the car. Back at the scene, Chief Bedford and Policeman Carmichael lay dying of their wounds and six ordinary citizens were wounded. Onlookers rushed to hardware stores for pistols and rifles. They opened fire, and a rifle bullet struck one of the fugitives in the arm and "spun him around." "This is getting too hot," shouted the leader, the two-gunned bandit who was found later to be named Henry Helms. So they jumped back in their car with the flat tire and the two little girls. They left behind the wounded bandit, and Santa's sack with $12,200 in cash and $150,000 in non-negotiable securities. Quoting House again, "They raced out Main, two of the desperadoes firing back at the automobile filled with pursuers. The driver swing onto a dirt road and his companions tossed roofing nails out to puncture the tires of the posse's machines. then he turned into a lane and at last out into a pasture but as the car dashed through cactus, mesquite and scrub oak, the growth became so heavy that further progress was impossible. "The men warned the little girls (Emma May Robinson, ten, and LaVerne Comer, twelve) to crouch down in the car and then the thicket swallowed up the trio." "Officers and citizens poured in from all that section of the state and such a manhunt as Western Texas had never seen before was soon in progress .... Many members of the posse were horseback or on foot as they beat their way through clumps of trees, searched high grass in the bottoms of ravines and peered around bounders in canyons. "There came an excited shout, for one party had discovered an overcoat and bloodstained gloves. Later, citizens found a suitcase and a pile of bloodstained rags. In the suitcase were cotton and gauze, showing that the bandits had entered their enterprise with the knowledge that there might be shedding of blood, including their own. "The pursuit continued all through that Friday afternoon, Friday night, and throughout Saturday and Saturday night. One of the results of the Yuletide crime was its tragic implications for little children in Eastland County. On Christmas Eve, a church in Eastland was filled and as jolly Saint Nicholas entered, a little boy called out, with a quaver in his voice: 'Santa Claus, why did you rob that bank?'" Chief Bedford died on Christmas Day, and Policeman Carmichael a few days later. Santa Claus was really a crook named Marshall Ratliff, who had lived in Cisco before being tracked down and imprisoned for a bank robbery in Valera by the very same Chief Bedford. Though Ratcliff was given a long prison sentence, he had been paroled just before the Cisco bank robbery. Since he knew he would be recognized if he returned to Cisco, he decided to conceal his identity by disguising himself as Santa. Such a disguise would also allay any suspicions by people in the bank. Who would suspect Santa? During the shootout, Ratcliff suffered two wounds, one in the chin and one in the leg. Robert Hill, the one who had followed Santa into the bank, had been struck by a rifle bullet at the point of the aborted transfer from the getaway car to the one driven by clever teenager, Woodrow Wilson Harris. Afoot, the desperados, Ratliff, Hill and Helms, were able to steal a car, find food, and eventually, con a young driller into the use of his automobile, taking him along as prisoner. Old man Wylie, father of the young man, seized his shotgun and fired after the fleeing car. The bullets struck his son. After hiding out all night with nothing to eat but oranges, which they did not offer to the injured young hostage, Helms, Hill and Ratcliff came up with a brilliant idea. They would hide in plain sight. They would return to Cisco! In Cisco again, they stole a car, and released the wounded driller. "Soon, a posse was hot on the trail. Next morning, a force of pursuers was in the little town of South Bend, in Young County, when a single-seated machine with three occupants was seen approaching. The driver caught sight of a gun in the hands of one of the officers and began backing rapidly down the road. Then, as the members of the posse scurried into their automobiles, the car whirled and rushed away. "In the second car of pursuers was Deputy Sheriff Si Bradford of Eastland County, one of the most noted officers of Western Texas. Early in the century, he had brought law and order into the coal fields of Strawn and neighboring towns; then he served as an officer in Ranger during the turbulent oil days. His career was filled with gunfights in which Bradford's coolness and marksmanship always brought him out he victor." If that isn't exciting enough, the bandits fled into an oil field where they ran toward the wells. "Before Bradford's car had rolled to a stop, he was out with Old Betsy, his double-barreled shotgun, an extra pair of shells in one hand. Bradford fired once and one of he fugitives fell. Bradford reloaded before firing again. "I did not want to be caught with an empty gun if they turned and made a stand," he explained afterward. The bandits ran on, firing back over their shoulders. Again Bradford shot, and a man went down but arose and staggered on. The officer shoved the other shell into the gun and shot again and the third desperado slumped to his knees but got up and reeled on, disappearing among the derricks." The captured outlaw was Ratliff. He was a "walking arsenal, for he bore no fewer than six pistols" including the one he took from the bank. Santa had been caught! "The territory into which Helms and Hill had escaped was traversed by the winding Brazos River [which offered] ideal concealment. The hunt, directed by Ranger Captain Tom Hickman, was pressed on, to allow the wounded men no opportunity for rest. Airplanes were used but were not able to spot the fleeing men. However, their trail was picked up and it seemed evident that the end of the chase was not far because the footprints were close-spaced, showing that they were wearing from the long chase and weak from loss of blood. Marks showed that, to climb even a small rise, they had been forced to crawl." Hill and Helms were not apprehended until December 30th, seven days after the bank robbery. They had been attempting to find the location of a rooming house in Graham, but the man they asked for directions noticed their pistols and notified the authorities. Hill was captured with three pistols, and Helms with four. The greatest manhunt in the history of Western Texas had ended. 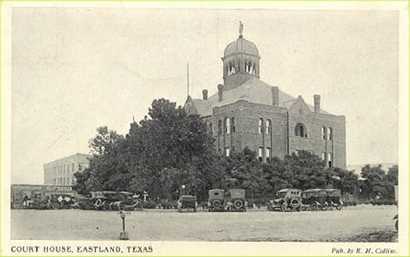 And the most celebrated of all the trials ever held in Eastland District Court's old courthouse, was also the last. At the end of this trial, the building was demolished. It was little ten-year-old Emma May Robinson's testimony that identified Ratliff as the man disguised as Santa Claus who had robbed the bank and kidnapped her. The jury's verdict was ninety-nine years. On the way to his cell, Ratliff muttered, "That's no hill for a high-stepper like me." Helms was sentenced to death, and Hill, who cried for mercy and told of his unhappy childhood, was given a sentence of life imprisonment. Ratliff was tried again, this time for the murder of Chief Bedford, and he got the death sentence. But that was not the end of Ratliff. No indeed. Feigning paralysis to his unsuspecting jailers while awaiting execution in the hot seat, the man who had played Santa managed to get hold of a six shooter, fatally wound one jailer, and violently fight the second jailer in hand-to-hand combat, sometimes able to get off shots which thankfully missed their mark. Most of the town, including the fighting jailer's daughter, watched helplessly through the jail windows, unable to break open the steel door to help. At last the courageous jailer pinned Ratliff down and beat him into unconsciousness, then returned him to his cell. Next night, a vengeful mob invaded the jail, grabbed Ratliff, dragged him to a vacant lot behind the local theater, and hanged him until he was dead. The notorious Christmas bank robbery ended as all criminal acts should end, even if it's Santa Claus: with Texas Justice. Once upon a time just a few years ago, a little pine tree stood in the deep forest, isolated and naked. He wondered aloud why he was so small and skinny while a big pine tree standing just several feet away had so many full and lusty branches. "[T]he most spectacular crime in the history of the Southwest ... surpassing any in which Billy the Kid or the James boys had ever figured."